I don't care how trendy they are, turtles are the best animal ever and everyone needs to recognize this. 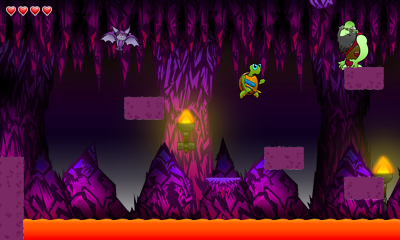 And now we have a new 2D platformer where you get to play as a turtle. Awesome! This game is coming from Saturnine Games, who made the DSiWare game Antipole. The graphical style is not quite the best but hey, I LIKE TURTLES!!!! Pass. Waiting on "Turtle Tales of Tortoisymphonia: Terrapin of the New World." And I gotta say; you've really grown up since we saw that video of you in zombie makeup years ago. As long as it's not as hard as Turtles in Time I'm excited. Can I play as Donatello? Because that's really the only reason I'd play this game. At least they put more effort into the backgrounds than Ducktales Remastered. Don't mock my World Turtle. Does that turtle have ANGRY EYES?! He means business.